NEW YORK (CNNMoney) -- Can't get enough of those virtual cows and crops from FarmVille? Good news, agrarians: Zynga toys and games are coming this fall. Hasbro (HAS), the big-time toy company responsible for My Little Pony and Monopoly, announced Thursday that it has bought the rights to license Zynga brands for a "wide range" of products. 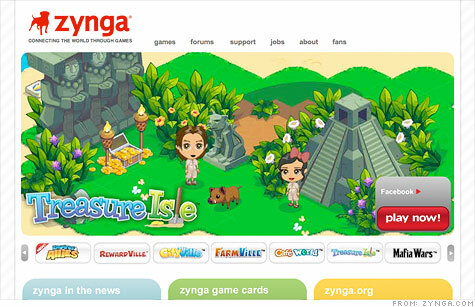 Mark Pincus, the CEO of Zynga -- which makes popular Facebook games like CityVille and Words With Friends -- said in a statement that the partnership is a "leap forward in enabling people to connect their virtual and real worlds." What toys are in the works? That's still being decided. Hasbro declined to comment on what kinds of products it will make and which Zynga brands will be included. The partnership could include "co-branded merchandise" featuring franchises from both Hasbro and Zynga (ZNGA), the companies said. At least one digital game brand has transitioned successfully to the physical world. Characters from the Angry Birds mobile game, developed by Rovio, have already been plastered all over the physical world: plush toys, baby clothes and even a feature film. Hasbro rival Mattel scored a holiday hit with its "Knock on Wood" game, which lets players fling actual plastic avians around, instead of digital birds.